Since this post first appeared on May 1, iNK has participated in two conferences: The 21st Century Children's Nonfiction Conference and ISTE. One result of our participation is that it was noticed an article in School Library Journal and in Publishers Weekly. An article for NPR's Mindshift, by Holly Korbey, featuring the iNK website and the I.N.K. blog as resources for parents is scheduled for release imminently. 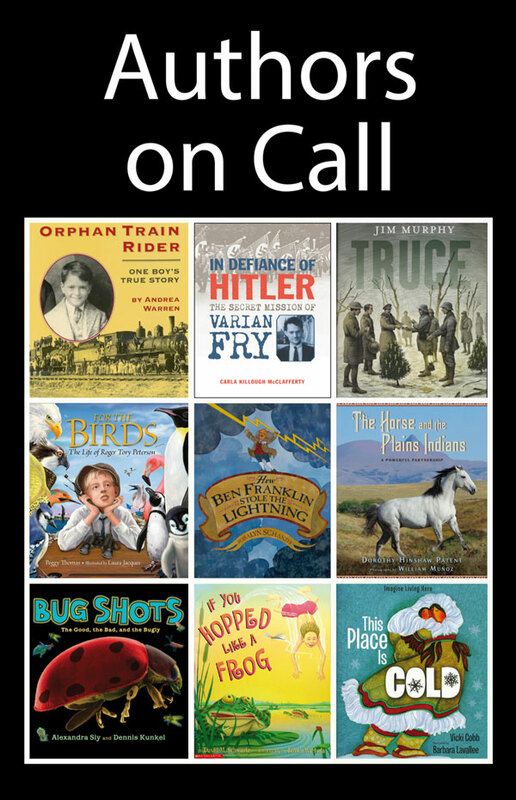 iNK Think Tank has been pioneering a new kind of interaction with schools through Authors on Call, a group of nine nonfiction authors who are equipped to do interactive videoconferencing. (Many authors now Skype but there are other ivc technologies that some schools prefer.) We call our programs Class ACTS where “ACTS” is an acronym for Authors Collaborating with Teachers and Students. They are not exactly school visits nor are they professional development for teachers but a hybrid that takes the books and expertise of an author and “bakes” it into the classroom experience with the “buy in” of the teachers and the students. Andrea Warren wrote up her Class ACTS experience and posted it on this blog here. Let me give you some other examples. I have been working with, Sarah Svarda, a media specialist from Discovery School in Murfreesboro, TN. She is using me as a mentor to help her 120 4th, 5th, and 6th grade library students learn how to do research. She teaches these students once or twice a week and since she has so many students and interactive videoconferencing is more effective with groups of 40 or less (so that kids can ask questions) we decided that I would meet the students in smaller groups over the period of time that they were doing their research. Sarah would then model the lesson to the other students who didn’t interact with me. So I met with the 4th grade just when they were starting the program, then with the 5th grade as they were several weeks into their research to help direct it more specifically, and then with the 6th grade as they were starting to write. I have one more session to go, which will be some kind of wrap-up. The students’ original idea of “research” is to look something up in an encyclopedia (or Wikipedia) and write up what they find, which often includes verbatim material, and turn it in the next day as homework. So, in effect, I was teaching them what I do when I start a project—a long term process that changes over time. As it happens, I’m just beginning a new book on hurricanes, so I do what all nonfiction authors do. I went to the library and took out every book on hurricanes I could lay my hands on. I showed the kids my pile of 25+ books and told them that I start by reading a lot of sources. This was a real eye-opener for them. I told them that I don’t read every book but that I look at all the books and read the ones that grab me first. This was another eye-opener—comparing sources and expressing preferences for different writers. In addition to the 4 videoconferences, Sarah and I also chronicle what we do on a wiki—a communal document. You can see the wiki for our work, as can parents and other people in the public, but only Sarah and I can write on it. Read it from the bottom up to get the chronology of our progress. We are also working with a group of teachers in PA. Sue Sheffer is a retired educator working with the York School District on a Library of Congress grant to help teachers use primary source material. 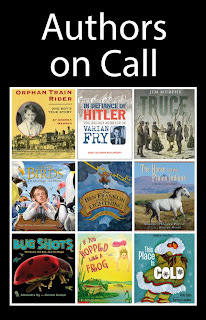 The group is scheduling sessions with our history authors: Roz Schanzer, Carla McClafferty, Jim Murphy, Andrea Warren plus Myra Zarnowski, our children’s lit consultant,who wrote a terrific book for teachers: Making Sense of History. The raves for each author have been off the charts. Alexandra Siy is working with teachers from Lewis and Clark Elementary in Missoula, MT. They are using her book Cars on Mars as a mentor text for their own research. Here is the link to their wiki. Again, the enthusiasm for the program is unequivocally positive. Author school visits are considered “enrichment.” Class ACTS are programs that are aligned with the curriculum and the classroom work of the students. They take place over a period of time from two weeks to several months. They bring the excitement of a school visit to daily work, although the author isn't present on a daily basis. Since a Class ACTS program is no ephemeral one-shot, it can be transformative for students. An author visit is about the author and the author’s book. Class ACTS is about students and their work. The shift is to the “demand” side of the school money—it’s where the rubber meets the road in terms of results, so here authors can make a profound difference. Students are discovering that doing work in depth produces a more thoughtful learning experience than simply “covering” material. And content is now starting to matter again. All educators know that the key to learning is motivation. When students are motivated they will do the hard work of learning. Having an author involved in the process provides motivation. Studies have shown that another character trait exhibited by successful people is grit. I maintain that none of us nonfiction authors would be here without it. We also exemplify the skills mandated by the Common Core Standards. Scheduling is much more flexible than a school visit because it’s just a short time during the day and you don’t need travel time, etc. So the videoconferences are booked with a short lead time and are given at the optimum time for the students. Teachers find that all day professional development sessions are not nearly as useful as having a personal learning network—a place to go to ask a quick question on an as needed basis. Through Class ACTS, an author becomes a part of the teachers’ pln with very positive outcomes. The teachers we’re working with this year are PHENOMENAL. Make no mistake, there is a lot of extra work figuring out how to use us and our books and our skills so that students benefit. The teachers we’re currently working with are early adopters who see something for themselves in taking a risk and doing something different. As a result, they are, perhaps, a self-selected group totally committed to their students and are doing the lion's share of the work. We authors are learning from them in this truly collaborative effort. I have no doubt that our incredibly successful outcomes are due to the quality of the teachers we’re working with. A successful program depends on planning, collaboration and commitment. But the rewards are beyond anything anyone imagined in terms of student output. It is humbling to see how much talent children have when you give them the opportunity to strive, think, create and shine. It takes patience for a new idea to take hold. The success of Authors on Call depends on schools that have the videoconferencing technology to understand the value of books and authors and for schools that appreciate books and authors getting the technology. We’re moving forward, however, and Authors on Call is leading the way. For more information on Class ACTS programs, you can download a pdf of our brochure here.